This Snowy owl had been chirping at some ravens nearby when it was perched on a telephone pole and they were flying above. Eventually one came too close which prompted the owl’s leap into the air. She looped around the pole once before settling on another one further from the mischief makers. While banking in the turn photographed above she cried out again. This time proved an excellent opportunity to photograph her “smile”. This entry was posted on February 25, 2015 by Christopher Martin. 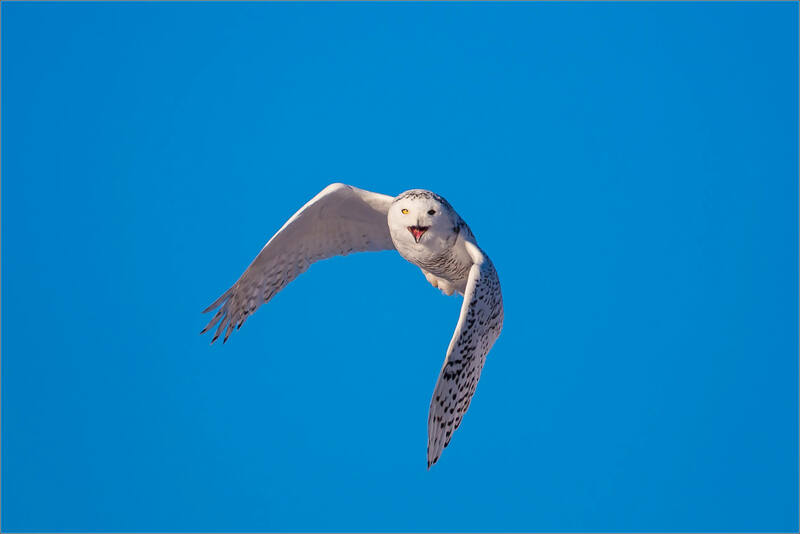 It was filed under Owls, Wildlife, Winter and was tagged with alberta, BIF, bird in flight, Bubo scandiacus, Canada, flying, Irricana, nature photography, owl, smile, Snowy owl, wildlife photography. What great opportunities you’ve capitalized one! The snowy owls are beautiful. Still haven’t seen one after close to 3 years in Alberta! Still hoping I’ll catch a glimpse. When is the best time of year to go looking for one? Hi Inger – thank you for taking a moment to comment. The Snowy owls winter around the Calgary area from roughly December to March. If you have a chance head northeast around Irricana and then south through Strathmore and even as far as High River. It’s always their choice but you I hope you find a few (and then a few more). They have started to appear in New England the last few years. Great shot. I’m still looking for my first photo opportunity. Good luck – I hope they cooperate with you! It had been two years since I had really good encounters after being skunked last year.